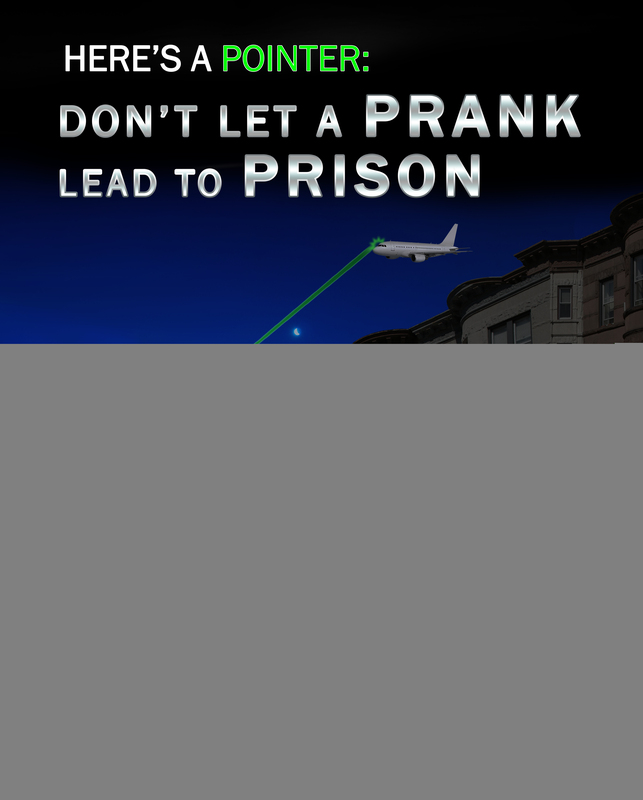 After a successful trial program aimed at deterring people from pointing lasers at aircraft—by rewarding those who provide information about individuals who engage in this dangerous crime and aggressively prosecuting the perpetrators—the FBI is expanding the campaign nationwide. A key part of the publicity campaign is reward money. For the next 90 days, the FBI will offer up to $10,000 for information leading to the arrest of any individual who intentionally aims a laser at an aircraft. “We want to encourage people to come forward when they see someone committing this crime, which could have terrible consequences for pilots and their passengers,” said George Johnson, a federal air marshal who serves as a liaison officer with the Bureau on laser issues. The original initiative, which began nearly four months ago, took place in 12 FBI field offices where “lasing” incidents are prevalent. Since then, there has been a 19 percent decrease in the number of reported incidents in the major metropolitan areas of those offices. Now, the Bureau—along with the Federal Aviation Administration (FAA) and the Air Line Pilots Association, International—are extending the program to all 50 states, Guam, and Puerto Rico. We are also working with state, local, and international law enforcement on the campaign, and we are conducting outreach to schools to educate teens about the dangers associated with lasing. In March, for example, a 26-year-old California man was sentenced to 14 years in prison for aiming a laser pointer at a police helicopter and a hospital emergency transport helicopter. The man and his girlfriend were using a device that was 13 times more powerful than the permissible power emission level for handheld lasers. The girlfriend was also convicted and recently sentenced to a two-year prison term. Since the FBI and the FAA began tracking laser strikes in 2005, there has been more than a 1,000 percent increase in the number of incidents with these devices, which can be purchased in stores or online for as little as a few dollars. Last year, 3,960 laser strikes against aircraft were reported. It is estimated that thousands of attacks go unreported every year. Multinational effort disrupts malicious software that has stolen millions around the world.